I've done several posts here in the past about Robert J. Randisi's novels featuring P.I. Miles Jacoby, which have appearances by and references to several other authors' P.I. characters. The Jacoby books also frequently mention two other P.I. characters of Randisi's, Henry Po and Nick Delvecchio. I've not read any of the Po stories yet, but all the Delvecchio books have Jacoby and Po in them. 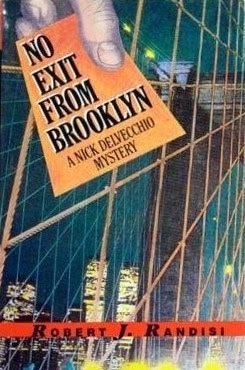 Furthermore, in the first Delvecchio novel, No Exit from Brooklyn, Delvecchio, needing to enlist the services of a Boston P.I., contacts John Francis Cuddy at Jacoby's recommendation. Cuddy is featured in a series of novels by Jeremiah Healy. I just got Delvecchio's Brooklyn, a collection of nine short stories featuring Delvecchio. One of the stories, "The Vanishing Virgin," has an appearance by Ed Gorman's P.I. Jack Dwyer. Randisi obviously loves doing shout-outs like this, since his Gunsmith novels contain frequent references to Clint Adams' friend, Secret Service Agent James West (from The Wild Wild West) and a couple of his non-Gunsmith western novels have references to Loren D. Estleman's character Page Murdock. I haven't read any of the Delvecchio novels, though I read The Steinway Collection, not the novel with the crossovers but the original short story which lacked any crosssovers. By the way have you found any CU links to Murdoch? Not that I know of. As far as I know, the two Randisi novels that mention Murdock don't have any ties to any other characters who are already in. But then, I haven't read them, so maybe there are ties to the Gunslinger series or something else that I haven't found yet.